...by the time the water gets to the pools, it is a stress-melting 40 degrees Celsius. Miette Hot Springs in Jasper National Park are the hottest of the three hot springs with an average temperature of 54 degrees Celsius. But don't worry... by the time the water gets to the pools, it is a stress-melting 40 degrees Celsius! While you relax you can enjoy the beautiful view of Ashlar Ridge. This facility is open from May to mid-October and features two hot pools, one which is shallow and has a lounging area and wheelchair access. After your therapeutic soak you can take in some interpretive exhibits, or hike the trail to the source of the springs. There is also a cafe and gift shop for your convenience. If you are a serious hiker and would like to see some fantastic (really unbelieveable!!) views of the area, you can take a few hours and take the Sulphur Skyline Trail. Here you will find stunning 360-degree views of the surrounding mountains (sawtoothed ranges) and valleys (Fiddle River) - and perhaps a couple wildlife sightings! Make sure you take some water and snacks with you since this is a half day hike.Your reward after this hike? A long soak in the springs followed by a plunge in the cold pool! 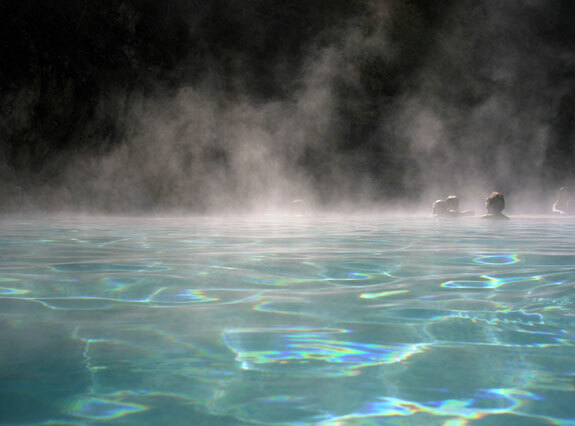 The Miette Hot Springs are located 61 km east of the town of Jasper. Take the Yellowhead Highway, otherwise known as Highway 16, for 44 km to the Pocahontas Bungalows and the Miette Road junction. Follow the Miette Hot Springs Road south up to the Miette Hot Springs. If you are in Hinton, the springs are 51 km westward. Go west on the Yellowhead Highway (Highway 16) for 34 km to Pocahontas Bungalows and the Miette Road junction. Follow the Miette Hot Springs Road south up to the Miette Hot Springs.